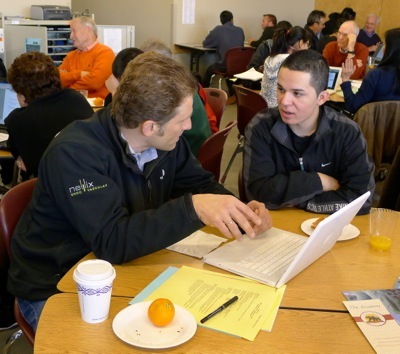 The Academy Program at Menlo-Atherton High School has developed a successful mentor program involving 70 adults in our local community, which was recently quite visible at the program’s student/mentor breakfast. The Academy is a small 150 student program committed to developing the academic, personal and critical thinking skills of select 10th through 12th grade students. While the majority of students are classified as “at risk” and come from low-income families, the program is based on college-bound standards. Incentive field trips are offered to students who achieve a GPA of 3.0 and better with the goal of encouraging students to improve academically and increase the number going on to higher education. 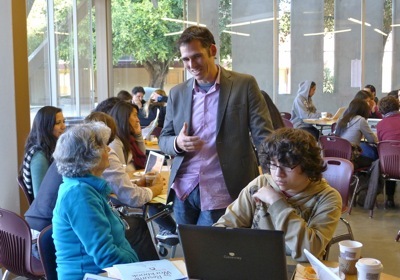 Chris Rubin (pictured below), Academy Department Head and Mentor Coordinator, began the current mentor program when he arrived at M-A in 2005. During his first year only 12 mentors were involved and times six students shared one mentor, waiting to ask a single question. Today, more than 70 mentors are participating in the program. Each is paired 1:1 with a student. Mentors include local residents, professors, and individuals from a variety of local Bay Area companies. They offer support, consistency, and an opportunity for students in the program to develop an understanding of the skills needed to accomplish future goals. At the breakfast meeting, students worked with their mentor to develop a resume. Three of the students immediately put their resumes to good use, acquiring jobs at Stanford Shopping Center, Malibu Grand Prix and a local bakery. Other discussions during the mentoring sessions include developing success strategies for high school, establishing realistic goals, and encouraging students to attend four-year universities. The program also provides the flexibility for each mentor-student relationship to be tailored to meet the needs of each student. Chris noted how “fortunate we are to have so many individuals willing to dedicate their time to our students.” While the program asks for each mentor to commit to four 90-minute meetings throughout the school year, you may see a mentor and their student shopping in Safeway, having a hot chocolate at Café Borrone or touring a local college campus during their free time. “It’s wonderful when you see a mentor who takes a real interest in seeing their student find success,” said Chris.